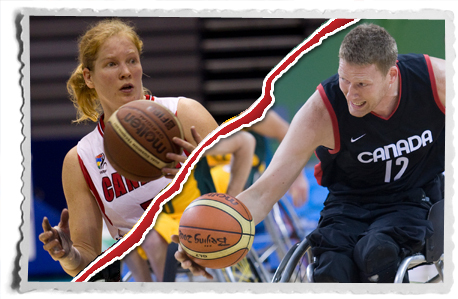 (Las Vegas, NV) Wheelchair Basketball Canada is pleased to announce the pool of 26 athletes selected to represent Canada in 2012 as the Senior Mens and Womens National Wheelchair Basketball Teams prepare for the London Paralympic Games. For the first time in program history the Canadian womens team will fully centralize in Winnipeg, MB beginning June 4th, 2012. Fourteen women have been named to the preliminary roster, which will be cut down to 12 athletes in time for the London 2012 Games. The 12 men and 14 women were selected from a pool of 37 athletes who attended a weeklong selection camp January 9-13, 2012 in Las Vegas, Nevada. “We want to reestablish Canada as the world leader in wheelchair basketball, and we are confident in the talented teams our coaches have assembled. With the ongoing support of our key partners Own the Podium and the Canadian Paralympic Committee we are poised for success in 2012 and beyond,” said Wheelchair Basketball Canada high performance director Paul Zachau. The senior mens team is the defending Paralympic silver medalists, and is looking for their third gold medal and fourth consecutive podium finish in London. The 2012 mens roster includes 11 returning players, 9 of whom have Paralympic experience. “Our goal is to win the gold in London and to do that weve got competitions lined up against the best teams in the world – definitely all top 5 teams. And we plan on pushing our athletes a lot harder over the next eight months in terms of fitness and tactical preparation,” said mens head coach Jerry Tonello. The senior womens team last medalled at the Paralympics in 2004 where they took home bronze (their fourth consecutive Paralympic podium finish which included an unprecedented three consecutive gold finishes in 1992, 1996, and 2000). The 2012 womens roster includes 11 returning players, six of who have Paralympic experience. “We have a good mix of experienced players and less experienced players that are really hungry to win,” said womens head coach Bill Johnson. “We are looking forward to kicking off the next phase of our training toward London. We are really confident we are on the right path and we are going to bring home the gold medal,” said Johnson. The Senior Mens National Team is amongst the top wheelchair basketball teams in the world. The Canadian Men are the defending silver medallists from the 2008 Beijing Paralympic Games. They won back-to-back Paralympic gold medals in 2000 and 2004 and have reached the podium at five of the last six consecutive World Championships. The Senior Womens National Team is amongst the most successful and dominant teams in Canadian amateur sport history. The team captured three consecutive Paralympic gold medals in 1992, 1996, and 2000, and bronze in 2004. They have also reached the podium at six consecutive World Championships. Wheelchair Basketball Canada is the national sports governing body responsible for the organization of wheelchair basketball in Canada. It is a non-profit, charitable organization that is the Canadian member to the International Wheelchair Basketball Federation (IWBF). Wheelchair basketball is a fast-paced, hard-hitting, competitive sport that has emerged as one of the most competitive and athletic sports played at the Paralympic Games. Our senior national teams are held in high esteem around the world for the elite skill and control that placed them on the podium with a combined five gold and one silver medal in the last five Paralympic Games.